GCCA 26th Annual Conference attendees, from left, Assistant Director/Training Director Katie Bigalke Jones, Ph.D., current counseling center Intern Deonna Kitwana, and counseling staff members Angela Landers, and Nikita Robinson. 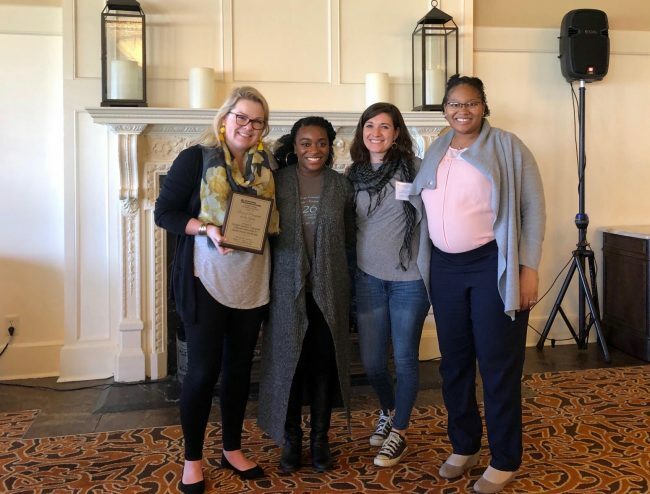 The Georgia Southern University Counseling Center was awarded Clinical Program of the Year for its Doctoral Internship in Health Service Psychology program at the Georgia College Counseling Association 26th Annual Conference in St. Simons Island from Jan. 30 through Feb. 1. In addition, Counseling Center Executive Director, Jodi K. Caldwell, Ph.D., was awarded College Counseling Director of the Year. The Doctoral Internship program is 2,000 hour, American Psychological Association accredited training program with a mission of offering high quality training in the practice of health service psychology. Known for its flexibility and unique tailoring to the training goals of interns, the program focuses on application of clinical theory and research and requires interns to learn to and abide by ethical, legal, and professional standards of the field. The counseling center combines didactic and experiential learning via a practitioner-apprenticeship training model/method and is currently a member of the Association of Psychology Postdoctoral and Internship Centers. Oversight of the internship program is facilitated by Assistant Director/Training Director Katie Bigalke Jones, Ph.D.
Caldwell received her doctorate degree in counseling psychology in 2000 from Texas Tech University, in Lubbock, TX, where she also completed her pre-doctoral internship. She joined the counseling center staff in 2000 as a staff psychologist. She has since served as the Assistant Director for Training and the Interim Clinical Services Director. Caldwell has been the director of the center since January 2012. Caldwell is also chair of the university’s Sexual Assault Response Team, serves as the President of the Board of Directors for the Teal House: Statesboro Regional Sexual Assault Center and represents Georgia Southern on the Ogeechee Judicial Sexual Assault Response Team and Eastern Judicial Sexual Assault Response Team. On a national level, Caldwell is currently serving her second elected term to the Directorate Board of the Commission for Counseling and Psychological Services of the American College Personnel Association and is a certified Red Cross Disaster Mental Health Responder. Caldwell was the recipient of a 2005 Award of Merit for Excellence in Service to the Georgia Southern University Community, the 2006 Commitment to Advocacy Award for dedication to the issue of Sexual Assault Education, the 2010 40 Under 40 award from the Statesboro Herald for professional achievement and the 2014 Outstanding Contributions to Counseling Center Work award from Division 17 of the American Psychological Association. The counseling center is an International Association of Counseling Services accredited center that offers individual, relationship, and group counseling, in addition to drop-in workshops.